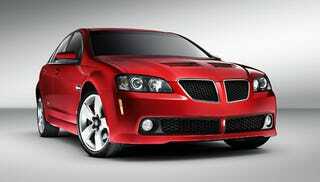 The Pontiac G8 sedan and Ute will live on as the Holden Commodore SS V-Series in Australia with the trademark Pontiac grille. Oh, and there's a wagon. Photos of the badgeless beasts below. We're not sure what hurts the most: the existence of the Pontiac G8 we're never going to get, the Sportwagon we'd have killed for, or the fact that these are all essentially GXP-spec vehicles. Prices range from approximately $41,600 for the Ute to $50,000 for the Sportwagon. It hurts to look.